No one knows. We are not sure if the numbers started at 1 or if they are even sequential. 1) For the most part, orders are supposed to be first come, first serve. You aren't going to get pushed back in line because a big company ordered 10000 units, but only if they get them in the next month. 2) Kickstarter backers are the first of the first. HOWEVER, even though they paid first, it doesn't mean that their Order Number is actually first. Kickstarter backers had to follow a link from an email to generate their order, and not everyone got in right at the beginning. They may have a later order number, but they are still ahead of you in line. 3) Modifying an order changes the order number associated with it. There may be people who started with order #3027, but changed shoe size or harness size, and are now order #7689, which would actually be good for you, since that means that some of the people "ahead" of you are actually just the same guy taking up two or 3 or even a dozen slots. 4) Orders may have multiple units. It's not just individuals who pre-ordered the Omni, some were purchases made by prospective arcades, who may have ordered a dozen units in a single order. I doubt it will be that bad, but it may mean that even though you are 9xxx in line, that you still need to wait for the 12xxxth Omni unit. Either way, I would figure to count on at least 2- 3 months for every thousandth place you are in line. They may move much faster than that, but at least it will be a pleasant surprise if they do. Wait a tick, is that the Omni? it sure looks like the Omni, but where is the green? And the Omni logo? Is Crisis Action re-branding them? Oooh, I remember that one. I didn't realize this was Hero Entertainment. For some reason, I was reading what little english was there as "Chris Action" which I thought was basically following the naming convention of "Max Payne"
With the proper context, it makes sense that at the very least there would be demo booths available, the same way they do over here. Frankly, I'm a little disappointed that Virtuix hasn't gotten us pathfinders access to this so that we can give feedback and help with development the way we did for TraVR Training Ops. Either way, I wouldn't be completely certain that customers are actually getting Omni units in china already. 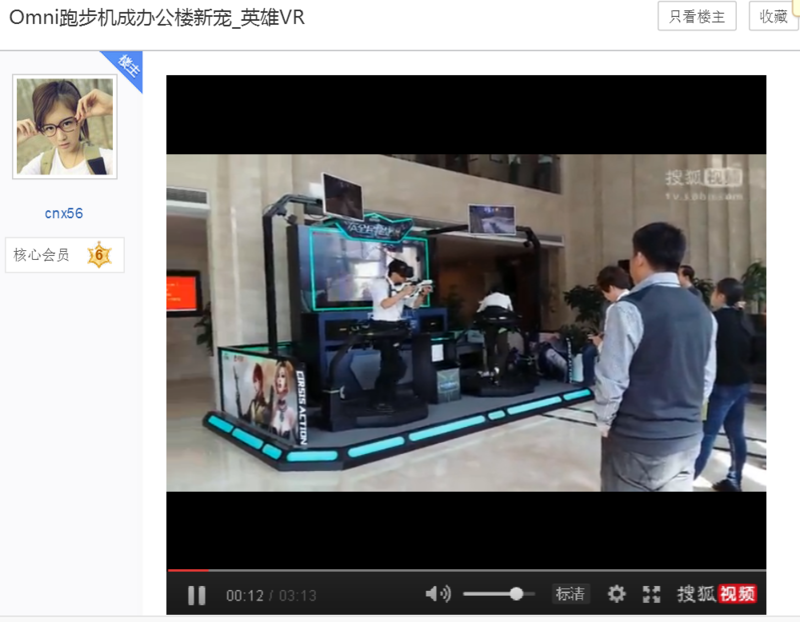 More than likely their China branch simply opened up pre-orders the same way that Virtuix has been doing. I could be wrong, it's just that this hardly looks like an official sales announcement. I recall reading that they said while they where handing out some units to demo and such that they would still honor the backers and early existing pre-orders before focusing on there corporate partners. i cant seem to find it. While i really hope that is the case a company like Hero Entertainment has the cash to throw around that can make easily upset the best lade plans. Fingers crossed that I really did read that and they stick to it. Come December 1st I really hope they have more, good, news about delivers. I'd be happy as long as some figures are included, currently all we know is units are arriving in the US and we have no idea if ANY have shipped. That first backer they showed awhile back I read was part of the PVT group and that the photo of him wasn't actually from a production Omni but a PVT Omni which means we have no idea if any have shipped or how quickly they are inspecting Omni's and shipping them to people or where they even are in the line yet. All these are things they should be telling us especially during a crucial time period like this when so many are hoping to get them by the holidays or sooner rather than later and when things are finally starting to kick off after all these years of waiting. ^.^ hoping the next news letter is jam packed with sweet info and not BS about publicity and events which lets face it, means literally nothing and isn't really related to production which is really what they should be focusing on in those letters, or at least giving us a much larger quantity of information about the process and where they are and speed etc etc. While that is true DanteM, and no figures have been released, we could easily do our own count (as long as that doesn't affect any embargo or NDA). All we need is to make a new topic, and add to it when someone has received their Omni and whether they are a Pathfinder, Kickstarter, or Normal Customer. If they include their order number in the post too, we can see roughly where processing is, and how things are going.